Trying to gain traction on Instagram? Thinking about running an Instagram giveaway to grow your audience and promote your brand? Now that the photo sharing social network has grown up out of the shadow of its big brother Facebook, the Instagram playing field is much more competitive. The sheer amount of people using the app proves that social media promotion is no longer an obscure channel for finding consumers. Every brand, including your competitors, are vying for the attention of your consumers on Instagram. Growing an Instagram page from zero to a thousand is no longer as simple as posting a pretty photo everyday. Here's where an Instagram giveaway can help you grow. Fun and engaging. 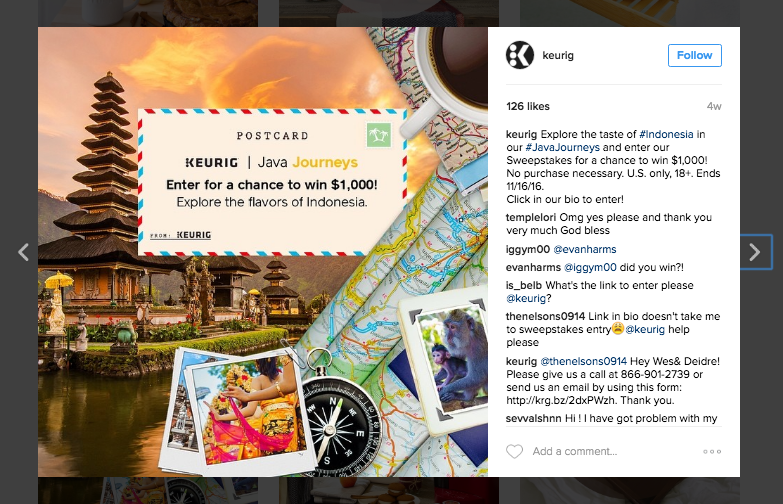 A successful Instagram giveaway develops the relationship between your brand and your target audience. Cost effective. All you need is a prize. Easy to set up, run, and replicate. Once you find a formula that suits your audience you can put one on as often as you'd like. Rinse + repeat = grow. Here are the 5 steps for running an Instagram giveaway. If you've decided to run an Instagram giveaway leading up to a holiday your theme choice is obvious. Christmas, Thanksgiving, Easter, etc. Your contest should always have a theme or a purpose. You don't have to wait for a widely celebrated holiday to do one. You can celebrate anything, your business' anniversary, a large event like the Olympics, or simply the change of season. The choice is entirely up to you, but be creative and choose a theme that your audience can celebrate along with you. In the example below, David's Tea created an exciting hashtag giveaway to promote their excellent tea selection. Followers can share their own flat lay photos like the one below, and use the hashtag #TeaExplorer and tag David's Tea for a chance to win a prize and be featured on the David's Tea Instagram page. 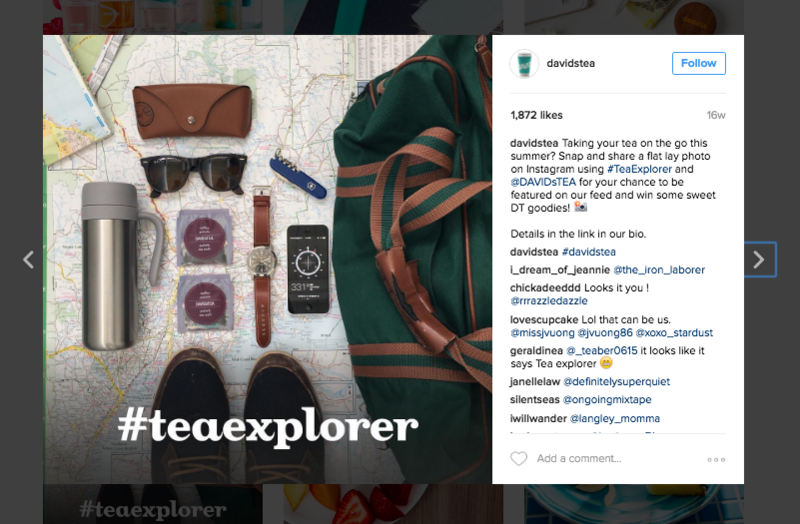 David's Tea was able to incorporate their Instagram giveaway around the theme of summer exploration. They got to engage with their followers, grow their page, and collect some excellent user generated content for future use. Like David's Tea, you'll want to create your very own unique hashtag that embodies the theme of your giveaway. It'll be used to organize all of the entries and add to the theme of the whole event. Remember to check if the hashtag is being used and try to be as original as possible. How will people enter? Be careful and think about you're trying to accomplish with this Instagram giveaway. Are you trying to increase your follower count? Then make it simple, require that participants follow you. This will lower the barrier to entry and ensure that you get more page followers. Are you trying to increase brand visibility? Then have participants repost the Instagram contest photo or tag their friends in the comments. Strategies like these ones will increase the visibility of your giveaway. If you're using an Instagram tool (like Wishpond) it makes creating and posting your contest rules much easier. Make the entry rules as easy to understand like the example below: (1) submit a photo; (2) follow the account; (3) use the hashtag. You have a choice of including the text in a caption or on the photo itself. Just make sure the timeline, rules, and prize are easy to read and understand to avoid any confusion. This step is straightforward. Choose an appropriate length of time for your Instagram giveaway. Balance is key here. Too long and folks might forget about the giveaway. Too short and there won't be enough urgency to make people enter. A long giveaway. If you know your prize is highly valued and predict that many will enter, you'll want to have a longer giveaway to allow enough time for promotion. But this is at risk of your giveaway losing steam during the latter half due to the excitement dying down as time goes on. A short giveaway. If your prize is on the small size and the purpose of the giveaway is just for fun and engagement then a shorter giveaway time is fine. These types of giveaways can be run often in short bursts. Obviously don't run these contests every week or the excitement might begin to dwindle. When it comes to choosing a prize there is one rule to remember: Choose a prize that ties itself back to your business. This way you'll guarantee your Instagram giveaway will only reach people interested in your business/niche. If you sell music equipment don't give away an iPad. You run the risk of people entering just for the iPad and leaving once the giveaway finishes. For maximum impact we recommend a prize package made up of smaller gifts so that it appeals to more people. Also, make sure to explicitly state the total cost of the prize package to communicate more value (e.g. Win a prize package valued at over $1200!). Your own products. This shouldn't be too difficult to pull off, giveaway your own product or service. It will expose more of your audience to your business and hopefully generate more positive reviews. A gift card or store credit. A gift card works well because customers can use it to buy from your business or a business related to your niche. 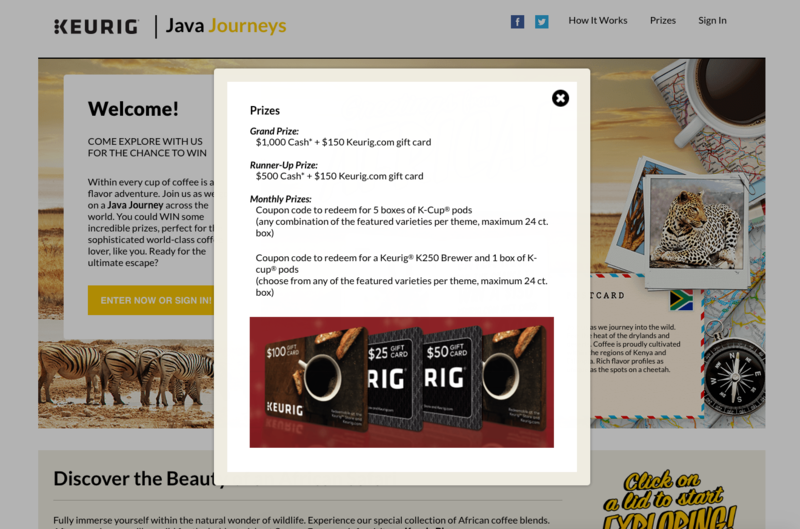 In the example below Keurig is giving away a grand prize of $1000 in cash plus a $150 Keurig gift card. There are several other prizes including Keurig brewers, pods, and gift cards. The prize ties everything back to Keurig. Now that you've picked your theme, solidified the rules, and picked your prize it's time to promote your giveaway. Paid. Google Adwords, Facebook ads, LinkedIn ads, Twitter ads, Pinterest ads. The options are endless. Wherever your audience is, there are paid advertisements that can reach them. For new businesses that have not garnered much of a following yet, paid ads are an efficient way to quickly promote your giveaway. Organic. Organic avenues for promoting your giveaway is really only limited by your own creativity. This could mean standing on a street corner handing out flyers or sending out emails to your well kept email list or adding a hellobar at the top of your homepage. If you're starting from scratch, immediate traffic will be hard to come by. Especially with the new Instagram algorithm-based feed. New accounts are encouraged to explore paid options at least until they can find some traction. For businesses that have the resources, paid ads are the fastest way to gain traction for your Instagram giveaway. Facebook ads are a popular choice for giveaways and contests. They target people by interests to find those most likely to be interested in your product or service. But don't neglect organic strategies. If you've already built a following it can be as simple as reaching out to your audience and having them share it with their like-minded network. Incentives for sharing your giveaway or added CTAs on your website will help it reach new people. 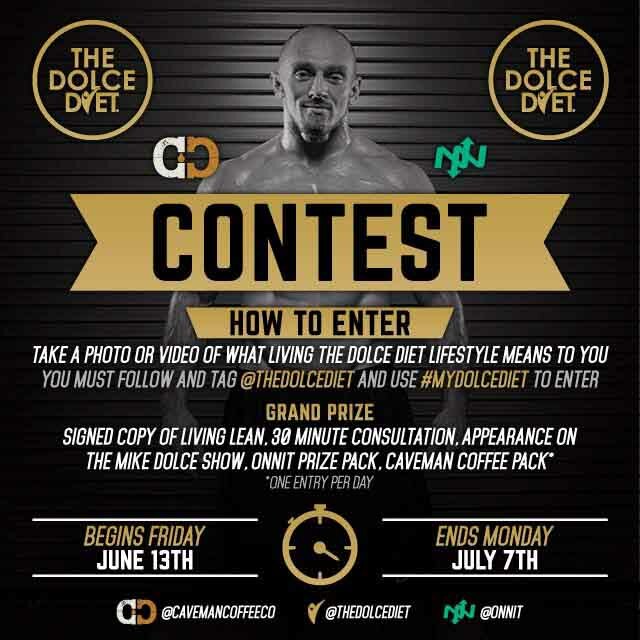 For businesses old and new, an Instagram contest is a fun and engaging way to grow your audience.